You might be anyone carrying nine bananas. You are in the Adventurer's Lounge, which is decorated with candles, hand-drawn maps, a trophy case, plentiful seating, and there's a closet to the north. You also see a giant flaming head, a monkey and Melvin the Robot here. The setting, the Adventurer's Lounge, is from ifMUD. It is likewise normally decorated with candles, maps, trophy case, etc. The size of the story file is 69,105 bytes. Monkey jokes have always been popular on ifMUD, and passing bananas from one player to another was (once upon a time) an occassional activity there. Round brackets, "(" and ")", were sometimes called bananas, and some of the bananas passed would be just have a round bracket character for its name. The description of Melvin mentions Floyd, the robot first seen in Planetfall (Infocom). The response "Eat the banana? How unseemly!" is a nod to Varicella (Adam Cadre; 1999; Z-code). One secret ending's rank is a nod to Varicella (Adam Cadre; 1999; Z-code). The NPCs can be talked to via ask-tell, but it's mostly just "ask". The maximum score is 10, including one last lousy point. 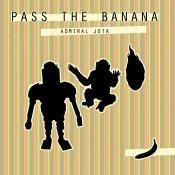 Pass the Banana (Admiral Jota; 1999; Z-code 5). IF Comp 1999: 33rd place of 37 entries. Download banana.z5 from the IF Archive - The story file. Or play it online at ifiction.org. Pass the Banana (archived) - at Baf's Guide. Pass the Banana - at IFDB. Pass the Banana - at SPAG. Pass the Banana - at IF Ratings. Review - by Mike Roberts. Download banana.wlk from the IF Archive - Plaintext walkthrough by the author.